Businesses rarely operate at peak efficiency. To make sure that an organization is doing as well as it potentially can be, you’d need to constantly re-evaluate, improve, and sometimes even completely re-work your processes. Business process modeling is a good start for that. What is Business Process Modeling, Anyway? Business process modeling is the graphical representation of a company’s business processes or workflows, as a means of identifying potential improvements. This is usually done through different graphing methods, such as the flowchart, data-flow diagram, etc. BP modeling is used to map 2 different states of the process: As-is, the state of the process as it is right now, without making any changes or improvements, and To-be, the future state, after making the changes or improvements. Want to learn how to do process improvement with as-is and to-be processes? Read up our guide. Business Process Mapping – dealings with both high-level and low-level mapping. i.e, it can be a very generic representation of a process, without getting into too much detail, or pretty much the exact opposite. Business Process Modeling – deals specifically with low-level process maps, with the main purpose being process improvement. While business process modeling, as a concept, is extremely useful, it’s not usually used as a stand-alone. Having a graphical representation of a process is good, but without the right implementation, you won’t go too far. The KPIs you picked to benchmark, for example, could be wrong. In that case, you wouldn’t have a realistic way to benchmark the new process to the old. Business Process Management (BPM) – A methodology of constant process re-evaluation and improvement. Just about the same thing as BPI and BPR, with the main difference being that BPM is continuous. That is, it’s not just a single process improvement initiative, it’s something you do constantly. Business Process Improvement (BPI) – Usually part of BPM, BPI means the mapping, analysis, and improvement of a single process. Business Process Reengineering (BPR) – Essentially the same thing as BPI, with the main difference being how you’d change the process. BPR tends to deal with more major changes to the process, such as incorporating technology to completely change the way a process works. Improving Efficiency – The main function of BP modeling is to improve the way the processes are done. As a given, you’ll find different ways to improve the way the process works, which leads to higher efficiency, productivity, output, and finally, profits. Enforce Best-Practices & Standardization – If you’re running a big organization, there’s a good chance that different teams do the same process differently. Creating the best-practice design ensures that everyone knows how to do the process. Process Agility – If BP analysis is a norm within an organization, they will eventually develop a culture of innovation and change. By being able to constantly tweak business operations, you’ll be able to evolve in the face of technological change. Transparency – Everyone within your organization will be, more or less, aware of how your processes work: what’s the goal, how it operates, etc. This leads to accountability; who owns what process becomes transparent. Beat the Competition – As a result of all the other benefits we’ve mentioned, you’ll be able to beat and outlast your competition in the long-run. Process flowcharts are the easiest and most widely used BP modeling techniques. The way this works is pretty self-explanatory – you map your processes step by step. The exact way you’d do this is up to you; the main idea, however, is to make it simple enough to understand at a glance. There are 3 ways to create flowcharts: pen & paper, flowchart software, or workflow management software. BPMN is an open-industry standard for BP modeling and was developed by the BPMI (Business Process Management Initiative). It’s essentially a standardized method for flowchart mapping; meaning, the objects used are defined by the methodology, not the individual doing the mapping. 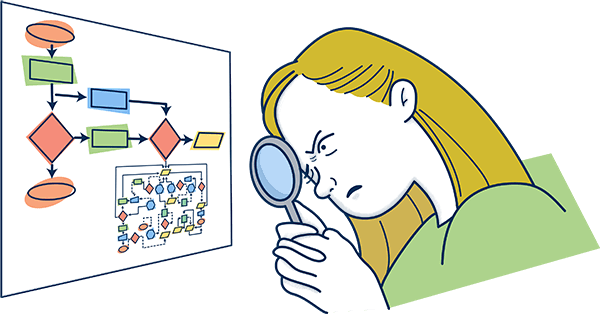 BPMN can be carried out exactly the same way as flowcharts, with the only difference being that you’d be using the elements within the graph as defined by BPMN methodology, not your own preference. Data flow diagrams are designed to show the flow of data from one source to another. It describes how these processes relate to each other and to the people who use them. It should be noted, though, that DFD isn’t about the technicalities of data storage. Rather, how the data flows through different processes. Other helpful business process modeling techniques include Gantt charts, role activity diagrams, simulation models, and several others. Model Existing Process – Use one of the BP modeling techniques to put the process you’re working with down on paper (or software). Identify Inefficiencies & Potential Improvements – How well is the process performing? Is it reasonable efficient? Is it meeting operational goals? Are there any steps in the process that’s overly wasteful? Design To-Be Process – Design the new and improved process depending on your findings in step #2, and finally put it into practice. As we’ve mentioned before, though, the implementation of the new process is as important as the modeling. So, it’s highly recommended to use BP modeling as a part of Business Process Management (BPM). Have you personally used business process modeling for your organization? Was it successful? Let us know down in the comments! To discuss this post in relation to your business - please schedule a chat with us. However – the tooling (as well as the person) is really important. Tallyfy for example – focuses purely on empowering both the business process owner and all their co-workers to actually follow the process easily, on the ground. Instead of starting with model first – you could start with “it’s already on the ground” first, and involve everyone in the making and executing of the model. At Tallyfy – we’re putting the “doing” before the “mapping” so that you get over this major problem.